I swear it – if it doesn’t stop raining around here soon, I’m going to sprout freaking gills. So far, we’ve been lucky and not had any actual damage (an advantage of not having a basement), but I’m just so very, very sick of rain and gray skies, and getting soaked every time I run an errand. Plus, the lack of decent light is kind of messing with the yarnography. On to happier things… a few weeks ago, Bryghtrose posted on the Knittyboards that she was going to be in the DC area, and wanted to know if any local folk wanted to meet up. I of course said yes, because I love to meet Knitty people. So, we made plans to meet for lunch and shopping at Stitch DC Georgetown. Then, while hitting the Woolwinder’s 4th of July sale on Saturday, I got an email from Turtlegirl76. She was ALSO going to be in DC on Monday. So, the three of us met up and wandered around Georgetown looking for an open restaurant for lunch. Apparently, nothing in Georgetown opens until 11:30. Happily, there was a place called the Alamo Grille that was willing to let us come into the a/c (It was HOT) and sit until they were officially open. Our very friendly Russian waiter spent most of his time with us teasing us in one way or another (bringing us what we ordered, but saying the wrong this to mess with us, etc.). And then he issued us a challenge. I’ll send you over to Turtle’s blog for that story, since she’s already got it up, and (unlike me) she remembered her camera. Cherry Tree Hill Supersock in “Maple Leaf” (left) and Dale Stork in #6 (right) – from the Woolwinder’s sale, for socks (possibly something from the new Summer Knitty) and Orangina, respectively. Crystal Palace Cotton Chenille in “Bougainvillea” and “Mango” (left) and Artful Yarns Olympic in “Tokyo” (right) – from the Stitch DC visit, for some Weekend Knitting Reverse Bloom washcloths, and probably Pullover Flair from IK Spring 06. 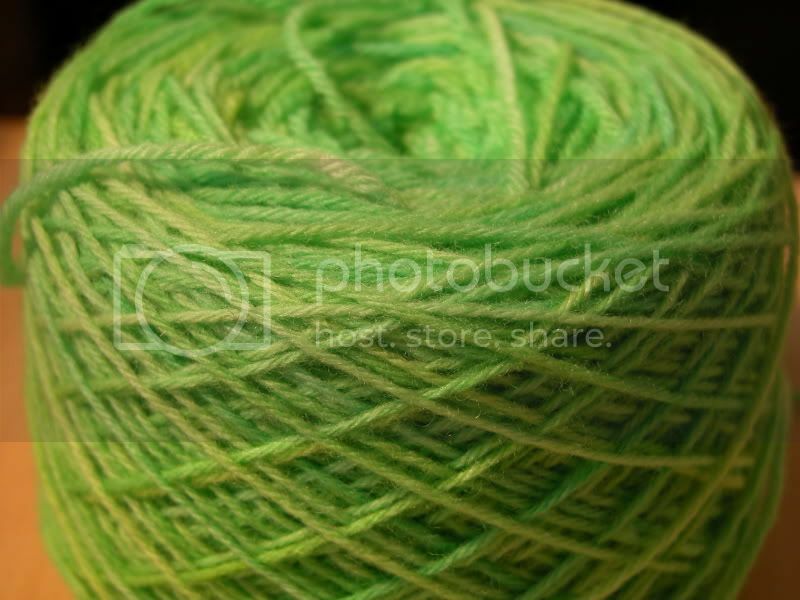 Turtlegirl brought me some AWESOME Kool-Aid Dyed KP Color Your Own sock yarn (GREEN!!!) 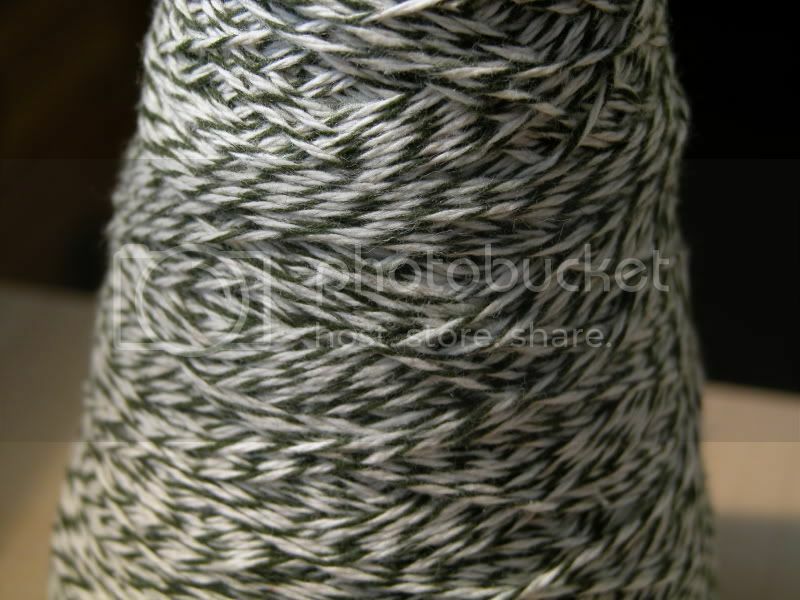 and a cone of olive green and white cotton sock yarn from her score at the big mill sale she went to. And tucked in with them? A new friend! 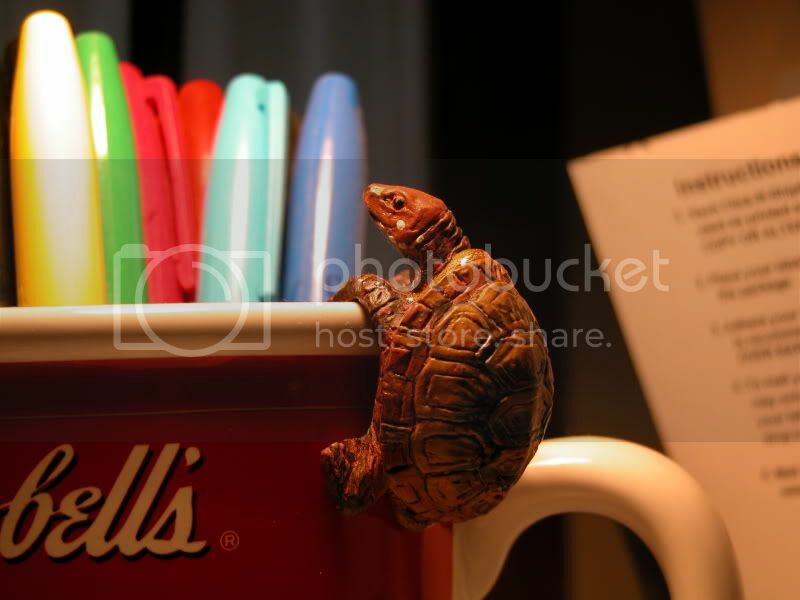 He’s now hanging happily on my Sharpie mug, where he makes me smile every time I see him. Thanks, Cristi!!! And to prove I’ve actually been knitting – my Hush Hush is at about 20% complete – I’m past the bottom lace and the eyelet row, and am about 2 rows away from beginning the decreases. I love the way it is working up, and I think it is going to be really, really pretty when it is done. Of course, with 400 stitches per row on US1 needles, that might be a ways off just yet. 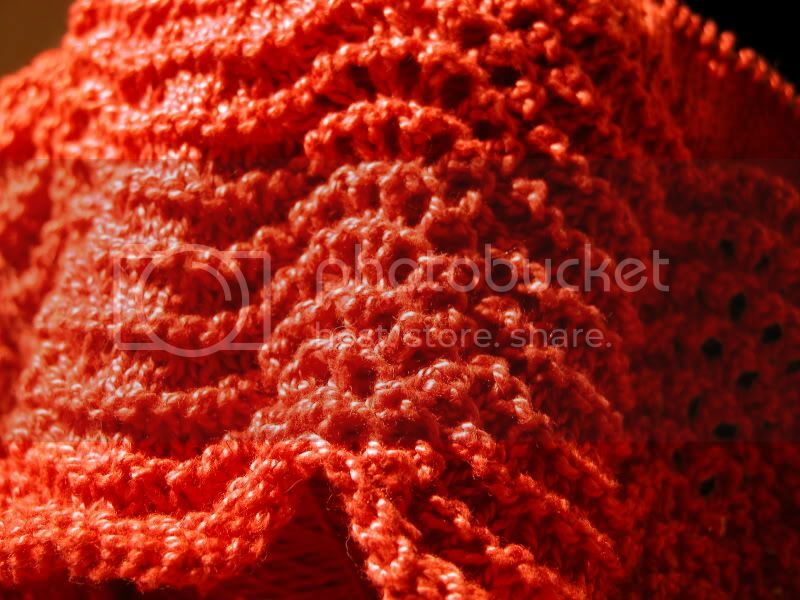 Here’s a closeup of the lace. Oh, and courtesy of Mintyfresh, who sent me a link to a free .pdf converter, my patterns are now available in an easy-to-print .pdf format! (links have been updated in the sidebar) Yay! Thanks, Minty! 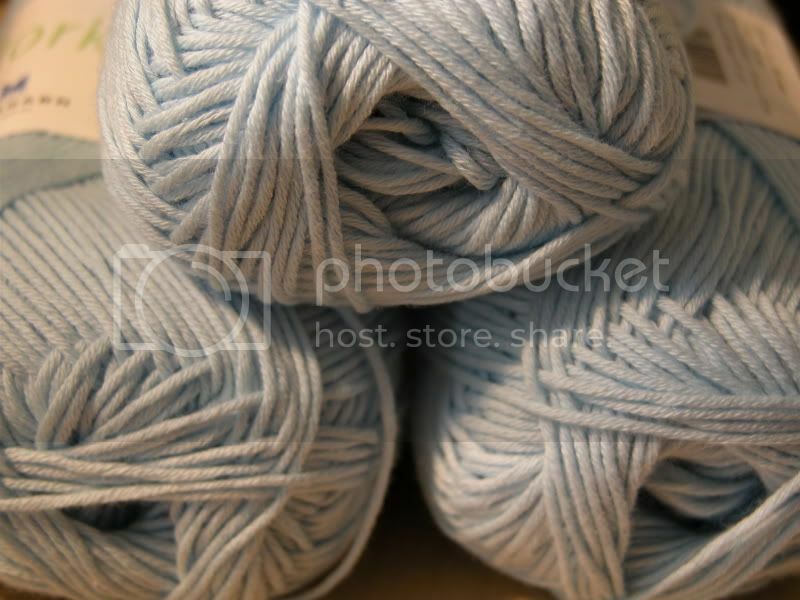 July 6th, 2006 | Tags: Knitting, Knittyfolk, WIPs, Yarn Acquisitions, Yarn Pr0n | Category: Misc. Yay for pdfs and yummy yarn!! YOu can send your rain our way, we have to water nearly daily because we just haven’t gotten enough rain. Sounds like a lovely day had by all. 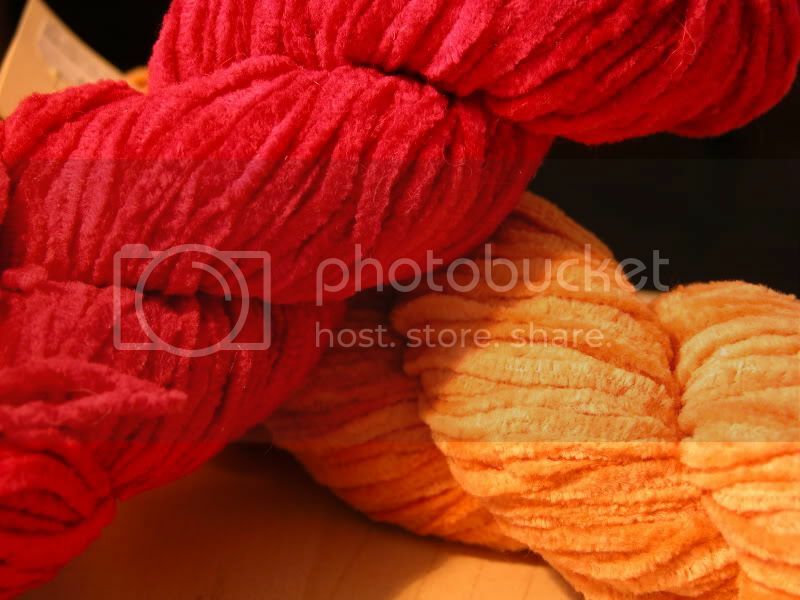 Beautiful yarn… I hadn’t thought of Dale for Orangina. I’m still working away on mine in Mandarin Petit. 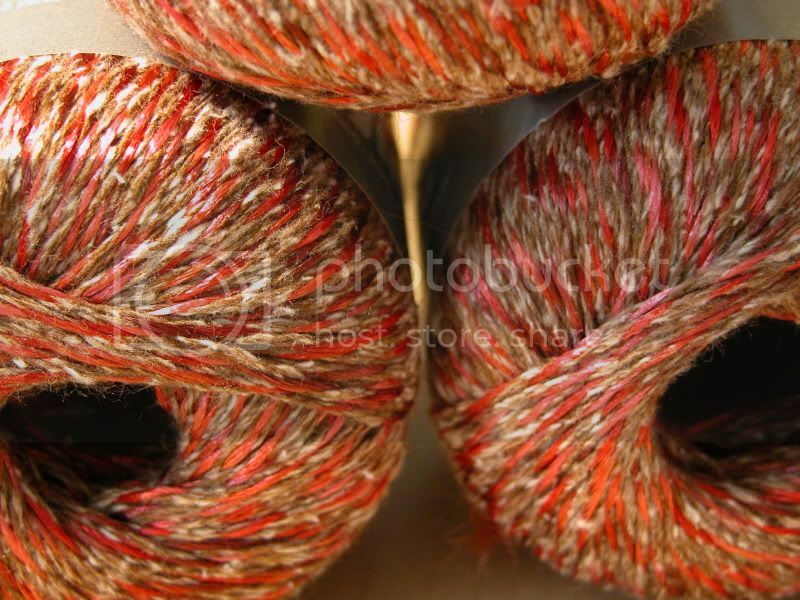 Beautiful yarn – you guys are so lucky to live near other Knitty folks! Sounds like you had a great day out. 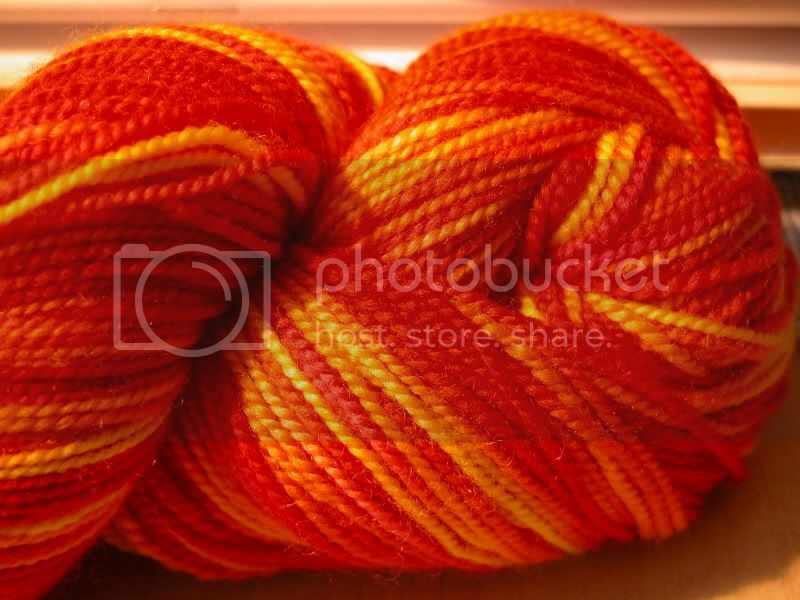 You’re getting as bad as TG for the yarn prOn. It all looks gorgeous. We’ve got the opposite problem, hot and humid with dire need of a thunderstorm to break it. Send the rain our way. And me, promising pr0n today all week of the yarn I bought – forgot her camera at work yesterday – d’oh! I’m hoping for time at lunch for pics. I had a great time on Monday and wish I was going right back up there this weekend for more! Thanks for the fix–great prOn. Stay dry!